Amazing reasons provided by the teachers for our well-deserved winners! A huge thank you to Bupa Dental Practice for donating this year's crackers - the children loved them! A huge congratulations to Cyrus who has been selected along with his dance crew to represent Great Britain in the 2018 Dance World Cup in Barcelona. What an achievement and amazing experience it will be! Look who's popped in for a visit! nearly half the school turned up today to take part in the Owl Challenge!!! 5 managed to get their badge.. all will be revealed on Thursday!! Congratulations to Eve in Year 3 who has achieved her Goldfish 2 badge! Keep swimming! Congratulations to all of our winners who received a festively full hamper of goodies. 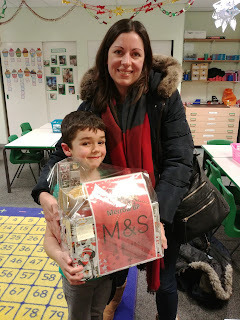 A huge thank you to M&S for donating the hamper above - I am sure our lucky winners will enjoy! What an amazing production we were treated to this week. Fantastic singing and dancing, appalling jokes(!!!!) and exceptional solo performances. Thank you for all your support and to all the staff and FAB for their help and hard work. Particular thanks to Mrs Friend Smith for her enthusiasm, commitment and hard work to ensure our children can have such a wonderful experience. We had our first 'Presents for Parents' today and our Year 3s and 6s have bought lots of goodies! Then our Choir and Recorder group entertained the Lunch Club with lots of festive tunes! Currently we have a hall full of Year 2 and 3 children busy making Reindeer cards - a lovely event! Next week preparations get well underway for our festive activities! On Tuesday I will be taking our Choir and Recorder players to the Methodist church lunch club for a sing-a-long. What an amazing day the children have had - they have thoroughly enjoyed the activities on offer and produced lots of wonderful crafts and Christmas decorations as well as song writing, cooking and so much more. The biggest and best thank you to Mrs Strange for organising the whole day, ensuring a range of exciting activities and sufficient adult supervision. We really appreciate the time and efforts this takes. Thank you. Thank you to Tescos for donating the ingredients for our yummy cakes! !